What are the crown jewels? 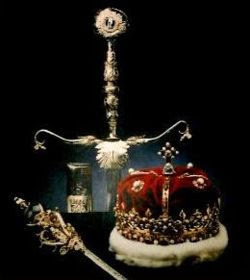 Crown jewels are the actual jewelry and other artifacts that belong to the sovereign ruler of a country. They are the regalia and vestments worn during coronation, as well as other important ceremonies. When that sovereign’s reign is over the crown jewels are passed along to the next ruler. 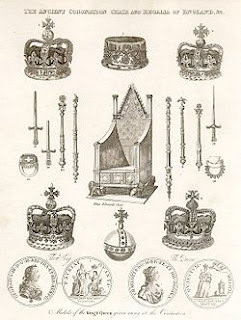 They are the crown, scepter, orb, spoon, ampulla, srings, necklaces, earrings, coronets, swords, mantles and coronation robes. The crown jewels are kept in the royal treasury and brought out on certain occasions. Today, I’ll discuss some of the major power players of Europe and their crown jewels, the United Kingdom (England, Wales, Scotland). This large, exquisite and priceless collection has been kept in the Tower of London, since 1303, due to a theft at Westminster Abbey. Sadly in 1649, Oliver Cromwell melted down the ancient crown jewels when he established the Commonwealth. In 1660, the Restoration began with King Charles II of England and Scotland, most of the regalia was replaced at a cost of nearly £12,185. He and his court worked hard to get the items sold off by Oliver Cromwell returned, and some of the melted metal (gold and silver) and some jewels were recovered. 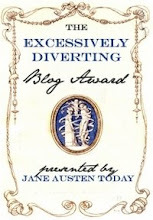 The only other in tact artifacts returned were some swords and a spoon. The coronation chair (from 1300) was not destroyed and was in fact used by at Westminster Hall by Cromwell when he was named Lord Protector. Saint Edwards Crown made in 1661, is said to have been made from the melted gold returned to the sovereign, from the crown of King Alfred (r. 871 – 899), and has also been rumored to contain gold from the crown of St. Edward the Confessor (r. 1042 – 1066) and pearls from Elizabeth I. Adorned with 444, the crown has been noted by most monarchs to be extremely heavy. It is used only during coronation, while the Imperial State Crown is used for other functions and ceremonies. Since Charles II’s reign many sovereigns and their consorts have added to the regalia and jewels. Part of The Queen’s crown jewels are the Cullinan I and II diamonds. They are the biggest diamonds in the world, found in 1905 at the Premier Diamond Mining Company in Cullinan, Gauteng, South Africa. Cullinan I is 530 carats, and sits in the Sovereigns Scepter. Cullinan II is 317 carats, and is placed in The Imperial State Crown. Another famous diamond in the Queen’s crown jewels is the Koh-i-noor diamond, which reputedly brings luck to an woman who wears it and ill-fate to any male who wears it. The diamond originally belonged to India and was given by Duleep Singh in 1851 to Queen Victoria. Wales has The Honours of Principality of Wales, which is what the crown jewels of the Prince of Wales are called. Included in the collection is a coronet (crown), a ring, a rod, a sword, a girdle, and a mantle. Most of the honours were redesigned in 1911, and do contain several coronets. One of the most famous coronets, Llywelyn’s coronet. Llywelyn III of Gwynedd (r. 1247 – 1282), took his crown/coronet the Cross of Neith, and other items to the Cymer Abbey for safe keeping while at war with England in 1282, he died later that year before gathering his possessions. The coronet and other holy relics were taken in 1284 from the ruined kingdom of Gwynedd, to London, from there they were taken by King Edward I and presented at the shrine of Edward the Confessor in Westminster Abbey. This coronet has been lost in history. Some speculate that the crown was given to Glyndwr when he was crowned in Wales in 1404. Some say it was stolen from Westminster Abbey in 1303. 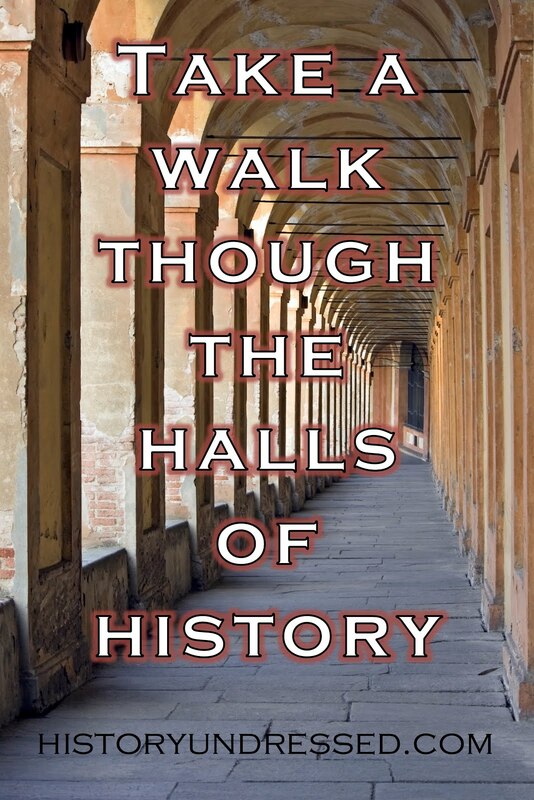 Most are sure that it did escape Oliver Cromwell’s destruction. Scotland’s crown jewels also called honours, are kept in Edinburgh Castle. 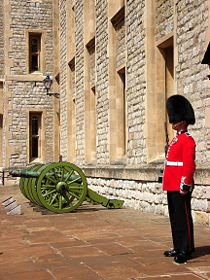 They are considered the oldest of the all of the United Kingdom’s crown jewels, because they escaped Cromwell’s hands. 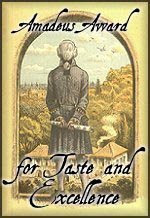 They were given over time to Scotland in the early middle ages by various Popes. In 1603, James I of England, aka James the VI of Scotland left the jewels in Scotland when he moved to England to take the throne. They include the crown, sword and scepter. It also includes the Stone of Destiny. When Cromwell occupied Scotland the jewels were hidden in Dunottar Castle, but soon Dunottar was besieged by Cromwell and his men. The local minister’s wife somehow managed to sneak the jewels from the castle and hid them in Kinneff Church, buried beneath its floor. In 1707, the jewels were moved to Edinburgh Castle, placed in a chest and there unbelievably forgotten for over a hundred years! Sir Walter Scott rediscovered them in 1818, putting them on display where they have been ever since. In 1296, King Edward stole the precious Scottish relic, The Stone of Destiny aka The Stone of Scone, taking it to England. This precious stone has been around for so long it is said to have been the pillow stone used by the Biblical Jacob. Since 847 it was used by Scottish sovereigns who sat upon it during their coronation ceremonies. 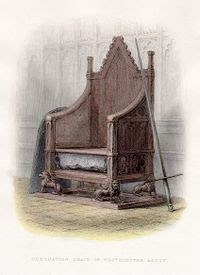 Edward I of England had the stone fitted into a chair in Westminster Abbey known as St. Edward’s Chair, which English sovereigns were crowned. For 700 years this stone was held in England, until in 1996, it was finally given back to Scotland, to be kept there with the exception of being used in England during coronations. lol, Delilah, seriously messed up isn't it? Thanks for the comment! Really interesting. I never knew what happened to Scotland's crown jewels. And I have always found the story behind Koh-i-noor diamond facinating. Another bit of jewelry info – Elizabeth I carried a bezoar stone in her crown. For those of you who might not be familiar with bezoar stones, they are the prettiest jewels of all. (A bezoar stone is basically an undigested mass of food, debris and hair trapped inside a goat or cow’s stomach.) Elizabeth I kept one in her crown to use as an antidote for poison in emergency situations. Nothing is prettier then a hair ball in your crown. Great research! I enjoyed reading this. As to the Scottish Crown jewels, at the time of King John of Scotland (Balliol- Ed I's puppet). when he tried to stand up to Edward i and was dethroned he was forced out of Scotland and exiled to France by Edward. At Dover when he was leaving apparently he tried to take the Scottish crown jewels with him (was never sure if he was trying to protect them from the English or if he was trying to keep them in the hands of the Balliol/Comyn family and away from the Bruce family). Edward returned the crown to Scotland but kept the great seal of Scotland which had far greater value in that it provided fealty of the Scottish crown to the English crown. Not sure when it was returned to Scotland but would imagine it was during the reign of Robert Bruce after Edward I was dead. Fabulous post Eliza. I haven't been to see the Crown Jewels in years. I'm going to have to make a pit-stop the next time I'm in London. Thanks for the info Jody! !